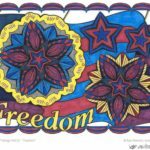 Are you wondering what to do with the all coloring pages you’ve finished? Why keep them hidden away in a binder or cluttering up the fridge when you can turn them into a functional and fun one-of-a-kind keepsake gift? In this tutorial I’m going to show you how to create a clock gift with a mandala coloring page like the one shown here. 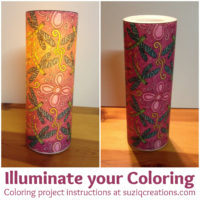 This is a fun craft project which is relatively easy and inexpensive. If you’re not into the DIY craft scene, I have some templates at the end of the article for you to simply upload your design onto a stylish custom clock you can purchase ready-made. 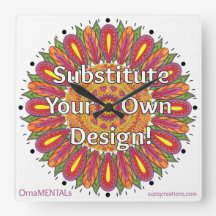 First off, you want to make sure you print the design you will use for your clock face on heavier paper like card stock. 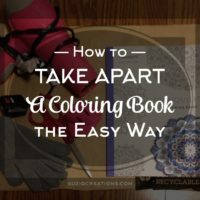 If you have an already colored design that’s not on card stock, you can still use it, but I would suggest making a color copy by scanning it or taking a photo and printing it on card stock. Scanning is going to give you the best result with no distortion, but a picture can work if you have good lighting and are very careful about getting a straight on shot of the colored page. 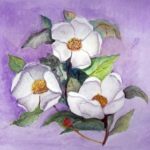 If you’re coloring a page specifically for this project, you can use whatever media you like as long as it does not add thickness to the paper that might interfere with the movement of the clock hands when you assemble the clock. As mentioned above, you’ll want to use a design that has 12 repeating elements in a circular pattern. Mandala coloring pages are perfect for this! The 12 repeating motifs in the design will be the hour markers for your clock. Of course, you can print your design with some space around it and draw in your own numbers, or run it through the printer a second time to add numbers or markers with these free printable clock face elements. If you do add numbers, any circular design can be used. If the clock you’ve chosen has a face smaller than 8 inches in diameter, you will need to scale down your coloring design to fit it. 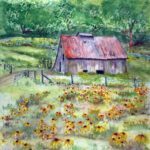 See my article with tips for printing coloring pages if you don’t know how to do this. The important thing to check before buying your clock is how the crystal (the clear plastic piece covering the face and hands of the clock) attached to the bezel (frame) of the clock. You want one that snaps in via two or three tabs and can be pried out with a flat-head screwdriver. You should be able to look inside the packaging to check for these tabs before you buy. Next, with your colored design ready to go, you can open up the front of the clock. Use a small flat-head screwdriver inserted between the bezel and the crystal to gently pry off the clock face cover. On a stable flat surface, place the clock crystal over your colored page and get it centered. Then hold it in place, and with your other hand, trace lightly with a pencil around the clock crystal. Trace around the clock crystal for the cutting guide. Using scissors, cut out the circular shape just inside your tracing line enough to account for the thickness of the plastic. Be careful, but don’t worry if your circle is not perfect because the edges of the paper won’t show when the clock is reassembled. Now you’ll need your X-Acto knife or a sharp craft knife to cut the hole in the center of your design for the clock mechanism. If you’re lucky, the mandala design you’ve chosen can serve as a guideline for cutting this hole. 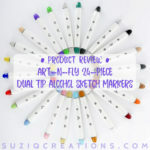 If not, use a ruler to mark the center point of your design where you’ll cut the hole. I just eyeballed the size of the hole to cut. Again, this does not have to be perfect because the hands will cover any imperfections. Just be sure not to leave any ragged edges or frayed paper that will block the hands from moving. Now, carefully pull the hands of the clock off the clock mechanism. If they aren’t plastic, they can be fragile and you don’t want to bend or break them. But usually they are plastic and will easily pull right off. Use the flat-head screwdriver to loosen them if necessary. Also pay attention to whether there is a “right side up” for the clock hands. Sometimes there isn’t a top side, but for some clocks there is. Now’s a good time to test the clock face inside the bezel before attaching it permanently. Make sure the center hole you cut is large enough, and that you have trimmed around the design enough so that the card stock lays flat without buckling. With the hands removed, you can inspect the clock to see how the face insert is attached to the clock you’re using. Sometimes it is a printed card stock attached with a few dabs of glue, which you can simply tear out. Sometimes it is a heavier material that can’t be removed easily, as was the case with my clock. 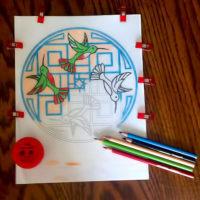 If you’re able to tear out the existing clock face you will probably want to use double-sided tape to attach your coloring page as the new clock face. Make sure you choose a thin double-sided tape that does not add thickness between the paper and the surface or your clock hands won’t function! If you can’t remove the existing clock face insert, you can coat it with glue and apply your new clock face design over it. I like glue stick because it’s easy to control and it won’t bond so fast that you can’t re-position your design if you need to. Make sure to apply plenty of glue around the outer edges, and around the center stem that holds the hands. If you get any glue on your hands, make sure you wash it off before touching the new insert so it doesn’t smudge your pretty design. Whichever method you’ve chosen, now it’s time to install the new clock face design. Make sure you get whatever element in your design that will be the hour markers lined up with the hanger on the clock so the “12” indicator is centered at the top. In my design, the bright yellow-colored petal centers make good hour indicators because they stand out well against all the surrounding darker colors.Also be sure the face is applied flat and that there are no bumps or buckling that could interfere with the hand movement. If it looks good and you’re happy with the new clock face, you can reinstall the clock hands. Hour hand first, then the minute hand, and second hand last. Check that you get the hour and minute hands are top side up (if it matters); the second hand can only go on one way. Next, it’s a good idea to install a battery, and check that the clock is working and the hands can move freely before reattaching the crystal. Once you have ensured the clock mechanism is working well, pop the crystal back into the frame and set the correct time. The finished clock gift with the coloring page clock face. You’re good to go! Is it time to color now? Easy Clock Templates – No Assembly Required! 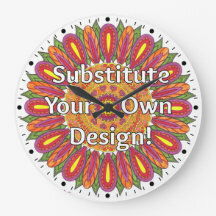 If you prefer not to purchase a clock and do the assembly yourself, I have created templates for several clocks on Zazzle which you can customize with your own scanned or photographed colored designs. These have numbers and minute marks built in to the template so you can move them above your design or remove them if you don’t want numbers. 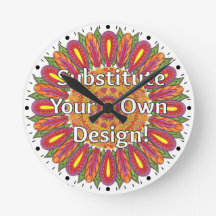 I’d love to see your clock craft project! Attach a picture with your comment below to show off your handiwork!